Finola. So graceful. Haven’t the tulips been wonderful this year. Such a joy at the end of a long, cold dark winter. 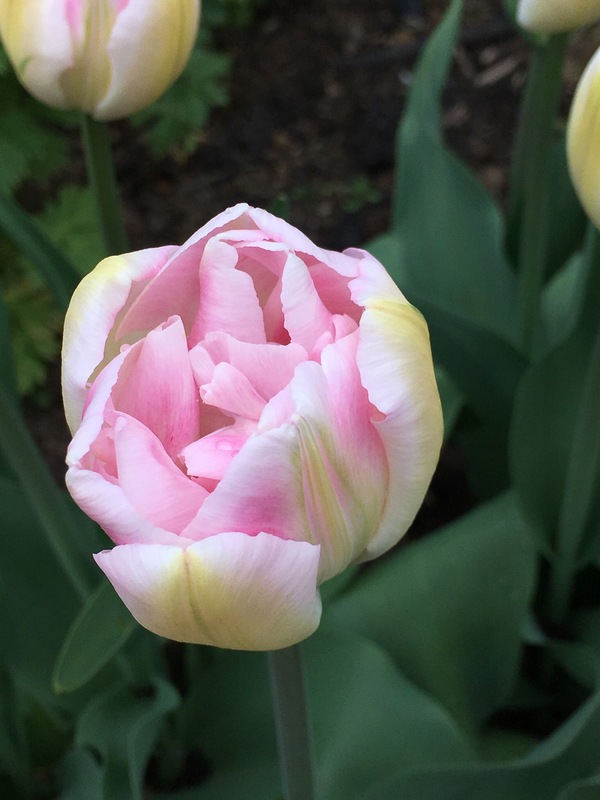 I love the creamy buds and green feathering on this double late, or peony-flowered tulip. We are all growing this variety in place of Angelique. Finola seems to be a stronger tulip. Grows to 50cm high and flowers in April and May. I’ve planted mine in a sea of blue forget-me-nots. Brunnera would be a good alternative if you are worried about the forget-me-nots seeding about. Good quality tulips and bulbs of all kinds are available from Bloms Bulbs and Peter Nyssen. What tulips are you enjoying the most at the moment? My tulips are all but finished now, but my favourite this year was Mount Tacoma. I have never grown Tulips and ‘thought’ I did not like them but having a new garden decided to grow some. Well I can now see great beauty in them & will plant more next year. Anemones are new to be too and those are just amazing. So beautiful. Can’t wait for ours to come up. Sounds beautiful and definitely something to look forward to. I’ve noticed that self-seeders tend to be a bit picky on our heavy clay – and the forget-me-not is in a place in the garden that I keep well weeded, so probably my fault. I do have brunnera and scabious ‘Butterfly Blue’. It is growing directly opposite the place where I have been trying to establish forget-me-nots (courtesy of a friend’s self-sowers). I might try an old parks department trick I learned many years ago. Set seedheads (decapitated) on a nursery bed and then just watch the little seedlings arrive (we stopped actually buying forget-me-not seed for bedding displays because of this). I should try the phacelia! Thanks for the suggestion.